All of us pet owners have heard of the Rainbow Bridge. There’s nothing scriptural about it, but for those of us who love our pets, and grieve over them when they leave us, we know about the Rainbow Bridge. Legend has it that the Rainbow Bridge is very close to heaven, maybe even a part of heaven. When a beloved pet passes away, that pet crosses over the Rainbow Bridge, where it meets and plays with all of its friends in rolling fields and meadows and beaches, chasing balls and Frisbees, waves and butterflies (maybe even a few mice, in the case of cats), and enjoying the warm sunshine on their fur. These pets are also totally restored to health, just as we receive new healthy and glorious bodies when we enter into heaven. It is said that one day, each of those pets will suddenly see their former owners. There is a joyful reunion, and these pets and their owners are finally reunited for all of eternity. Over the years, my mother had three dogs she absolutely adored. 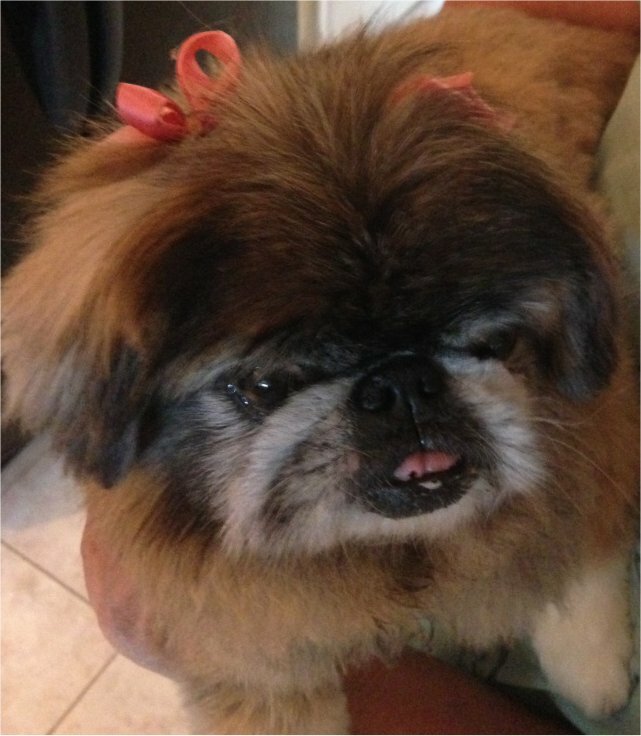 Two of t hem had passed away before her, and my husband and I took her Pekingese home to live with us after Mom died. Knowing the love my mother had for these special animals, and the joy and companionship they brought into her life, I totally believe her first two dogs were waiting for her in her mansion when she arrived at her heavenly home. I also believe when her Pekingese died almost 9 years later, that sweet little dog ran across the Rainbow Bridge and bounced up the steps to Mom’s heavenly mansion, barked to be let in, and they had a glorious reunion! I’m sure all three dogs quickly began playing together as my mom smiled in approval. The Lord loves us. You can open any page in your Bible and find a verse which tells you that. And He knows how much we love our pets. In the book of Genesis God gave man dominion over the earth and all of the animals on it, as well as all of the fish in the sea and the birds in the air. If He gave us dominion over them, He entrusted us with their care. And He commanded Noah to take two of each species of animal with him on the ark so the earth could be totally replenished after the flood. Let’s also not forget animals are mentioned as being in heaven. Isaiah tells us “the lion will lie down with the lamb.” And Revelation refers to the Lord and the armies of heaven coming forth riding on horses. I truly believe the Lord knew how much we would come to care for those certain animals He entrusted as our companions. Of course He knew. He created them as well as He created us. Because He knows the depth of our feelings for our special pets, why would He not have them waiting for us in heaven? “…with God, all things are possible.” (Matthew 19:26) I am believing and trusting that my favorite pets will be waiting for me, too, inside my heavenly mansion. With a heavenly “welcome home” party. And what a reunion we will all have! What pets have you had that you are looking forward to being reunited with one day? Share your comments with us. Next And My Cornbread is Blue…Blue?? Rocky, Lassie, Precious, Angel dog, Angel cat, Fluffy, Frosty, the black m cat (my mind went blank on the full name) .. I will have a lot of animals to greet me! Any many more in the future since I love having pets. Awwww….Mischief Tarbaby! How could you forget her name? Oh, I know. Pregnancy brain! And don’t forget Grandmom’s Muffin Puppy and the one you didn’t meet, Teddy Bear!